The Seven of Wands means that there will be a serious threat which can be overcome by self-reliance and your inner strength. 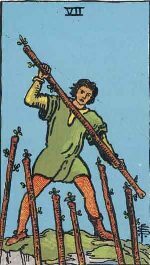 The Seven of Wands or the Lord of Valor appears when the subject is passing through a phase of uncertainty and wishes to finish off of his project anyway. This card appears when the subject fSevens demanding and formidable situations in life. We often fSeven challenging situations that stop us from seizing the momentous opportunities that have the potential to make our life fulfilling, happy and prosperous. This card advises the subject to believe in his abilities, fSeven the situation courageously and move forward. The card also points out that you can make your wildest dreams come true if you take up courage in both your hands and make a determined move. You must fight for achieving what you believe is your right without being apprehensive about the results.